In nearly thirty years of coaching Gregg Preston has not only impacted lives but started deep enjoyment in growing in the Lord using Basketball. That was evident in what is being talked about as an annual tournament of Comet alumni basketball players gathering during the Christmas vacation. 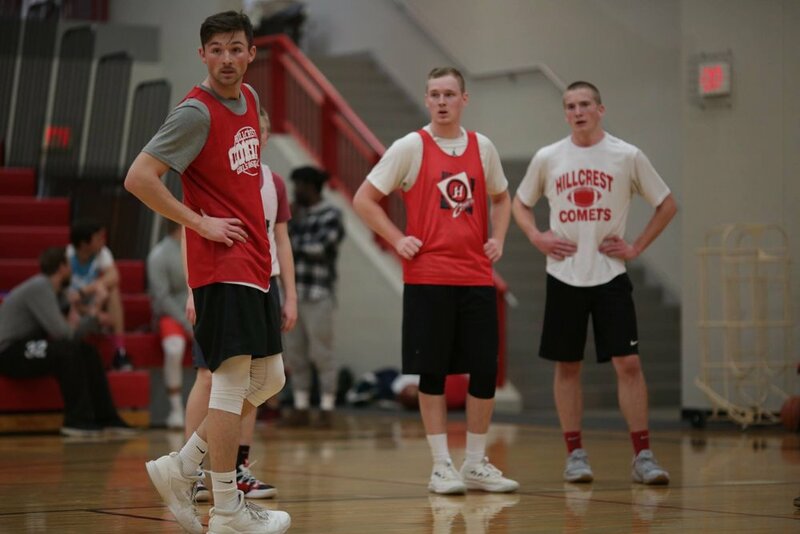 It was dubbed the Comet Classic, and brought in more than thirty alumni to watch and play basketball during Hillcrest’s Christmas vacation. Players from the mid-2000s stormed the court first. Daniel Nersten joined up with Micah Jones in a flashback game where the Comet varsity team shook off the memories of watching the tandem. The current varsity squad found great competition in the Comets of yesteryear. They worked to break down defense that was smothering and aggressive, the kind that has been a staple of Hillcrest basketball for more than three decades. The late game on Friday night was controlled by the early 2000s, with Daniel Berge and Ryan Garvin teaming up with JP Stender and Nate Jensen. One of the players Coach Preston first mentored, Evan Newman, joined the team to bolster the roster. The older decades showed why they earned bids to the state tournament, playing defense like they were in high school while shouting out commands to teammates. The Berge/Garvin tandem faced-off against Daniel Tungseth, Kyler Newman, and Andy Stender. To match the quickness of guys ten years their junior, they employed more recent Comets in Sean McGuire, Zak Zwiers, Daniel Preston, Sam Isaac, and Sam Ihrke. Saturday morning offered two games for each squad in the round robin tournament. After the first two games the President's office provided a sandwich lunch for spectators and players, adding to the excitement of being Comets watching favorite players from decades past. The oldest group of players, those from the early 2000s with Evan Newman, won all their games, winning the first Comet Classic. A number of the older players celebrated the idea of coming back to Hillcrest to play basketball. Many drew comparisons to the formative years of the Hillcrest Invitational Tournament (HIT), when church teams around the area would unite to play in a formal tournament against the Hillcrest varsity squad. Parents commented on the joy of watching brothers from different years play together again. One parent mentioned how fun it was to watch Comet teams spanning three decades play seamlessly together. It was a testament to a Coach who has taught Hillcrest players to love the game of basketball and celebrate the way God uses it to unite and inspire players and fans alike. Students walked Hillcrest’s halls under the gloom of war. The early 1940’s brought times of uncertainty, as World War II raged in Europe. But as men died and bombs exploded in France and Germany, Hillcrest’s students carried on their lives on the Home Front, mindful of imminent conflict. As the chapel filled, classmates talked, some muttering of the war. It is warm, and the dry, dusty atmosphere created a soft, brownish light. In the midst of dark talk, one student begins to hum the hymn “It Is Well With My Soul”. A friend joins in, and then another. The students in the next pew look over and nod. They must have come from Mrs. Skovholt’s class, a class that gave students a grounding in uncertain times. In a time full of uncertainty and confusion, there were still a few constants in school. One of these was English class. For Hillcrest’s students, English teacher Ruth Skovholt was a familiar face on campus. Some students perceived her as being strict and stern, a disciplinarian. “I never thought about her that way,” testified John Kilde, a student at Hillcrest in the early 1950’s, who gave insight into Ms. Skovholt’s teaching style. For Hillcrest’s students in the 40’s, English class started on a worshipful note. As the boys in ties and the girls in dresses shuffled into their seats, Ms. Skovholt, back turned, wrote a verse of a hymn on the blackboard. Then, she summoned the class to their feet and led them in singing. Ms. Skovholt would choose a hymn every week, presenting a new verse each day. By the end of the week, all the students would know the hymn, and Hillcrest’s halls would fill with song. In the memories of some, Ms. Skovholt was a disciplinarian, quick to crack down on nonsense, and a little stern. Others remember her as the teacher that came alongside and helped them when they were struggling, whether in academics or spiritually. “She was one of the biggest influences on my youth,” a former student said. Ms. Skovholt did have her quirks. She was a very traditional woman who taught classical grammar and literature. But at the end of every school year, Ms. Skovholt would destroy all of her notes, and start fresh the next year. She constantly rethought the books, poems and essays she taught her class. Her goal was to keep from getting “stale” as a teacher. John, who later became a Seminary Professor and a pastor, decided to follow in her footsteps, and used a lot of her methods in his own career. John was excited John explained to me Ms. Skovholt’s love for poetry. “I remember I memorized the end of William Cullen Bryant’s poem Thanatopsis,” he reminisced. “I loved Thanatopsis. I’ve quoted it myself many times since then. So when my summons comes/ To join the innumerable caravan/ Which moves…” John’s voice trailed off. “I forget,” he said bemusedly. Though Ms. Skovholt could appear to be stern, the impact she had on her students was great, she taught them a way of life, a love for worshipping God, and an appreciation of beauty in writing that lasted, in many of these students, their whole lifetime. Others testified to her great skill and passion as a teacher, her love for hymns and poetry, her fairness and originality. John Kilde, who was a When asked if he thought of Ms. Skovholt as a disciplinarian, John replied, “I remember I memorized the end of William Cullen Bryant’s poem Thanatopsis,” he reminisced. “I loved Thanatopsis. I’ve quoted it myself many times since then. So when my summons comes/ To join the innumerable caravan/ Which moves…” John’s voice trailed off. “I forget,” he said bemusedly. Though Ms. Skovholt could appear to be stern, the impact she had on her students was great, she taught them a way of life, a love for worshipping God, and an appreciation of beauty in writing that lasted, in many of these students, their whole lifetime.